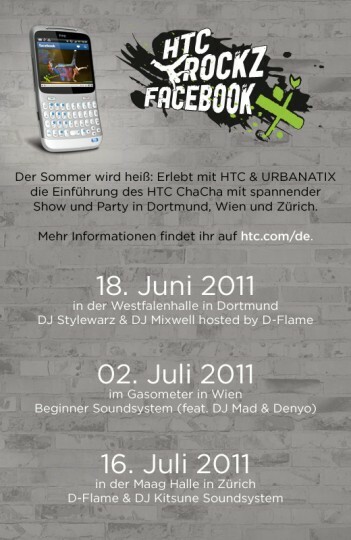 HTC only confirmed a Q2 2011 release window for the HTC ChaCha, one of its two “Facebook phones” announced at MWC 2011 a few months back; however, it seems the company’s own Facebook pages have tipped more accurate dates. 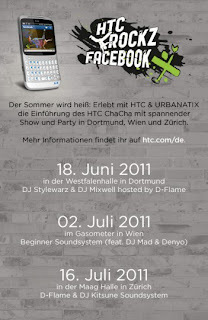 HTC Germany has announced a series of Facebook-centric events in Dortmund (Germany), Wien (Austria) and Zürich (Switzerland) kicking off June 18. The Austrian event follows on July 2, while the Swiss event will take place on July 18. We’ve seen HTC hold similar public launch events before; the HTC Sensation gave them cause to stage a party in London last month for the new flagship. Of course, that doesn’t mean the ChaCha – and perhaps its Facebook friend the HTC Salsa – won’t arrive in other markets first. HTC’s European range often goes on sale in the UK initially, so it’s possible the Android smartphone may show up there prior to mid-June.